A very busy day at DigIn yesterday, with Notts TV coming to film us for a clip on their news programme along with other visitors and all of our regular volunteers! 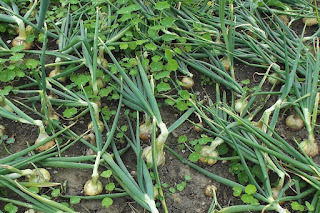 A bed of onions was harvested and some kohlrabi and a good few punnets of goosberries. Work Party Day - Great Success! A big thankyou to everyone who came to DigIn to help out at the work party today. A massive amount of effort went into tackling some of the jobs that never seem to get done. We had a fine day, both in weather - not as hot as its been recently, thankfully - and in company. Lots of jobs were crossed off the list but there are still some left for Wednesday, so don't worry, there's still plenty to do! We were treated to clotted cream, homemade jam & scones, doughnuts and cakes, so our efforts didn't go unrewarded - thanks folks! Here are a few "after" pics, everywhere looks so tidy - wonder how long that will last?! 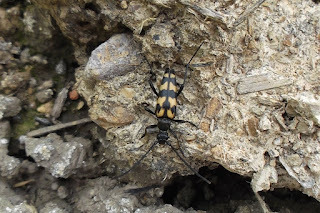 Here's a critter spotted admiring the work ... "Oh, I say, you have worked hard, I think I'll check out the bug hotel & stay a while ..."
A little reminder - tomorrow, Sunday 24th July is Work Party day at DigIn! If you have any time to spare and would like to help out at the allotment, please drop in anytime between 11am & 4pm. There are lots of jobs to do ranging from pond work (might be nice in the warm weather) to weeding and all sorts in between. It'd be great to see you, the drinks & biccies are free of course. Just ring the bell on the gate & someone will skip along to let you in. One of the reasons we put straw around strawberry plants is to try & stop this happening ... the small slug on the inside (top right) has eaten its way through the strawberry. A day of little jobs today. Watered the plants and newly sown seeds in the polytunnel and spotted a cucumber which has just appeared from nowhere! Saw it yesterday but I'm sure it wasn't there when it was planted a couple of weeks ago. These things grow so quickly! 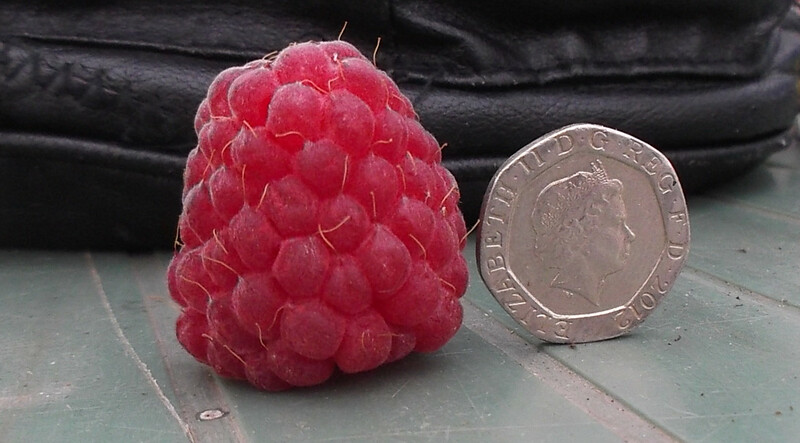 While on my walk around I noticed a HUGE raspberry. There's a pic here so you can see for yourself. We'll be slicing it up to feed us for the week! 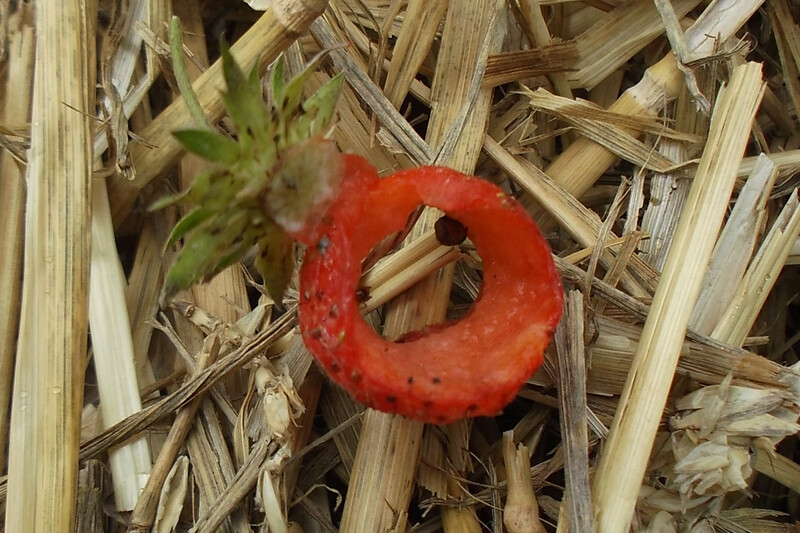 The second strawberry bed is now weeded and ready for its straw. 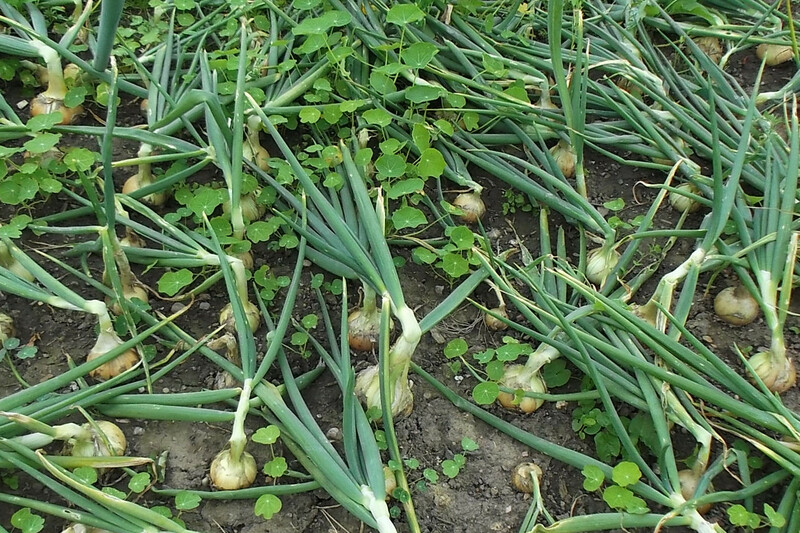 The onions are just waiting for some sun to dry them off & then we'll be harvesting them before too much longer. 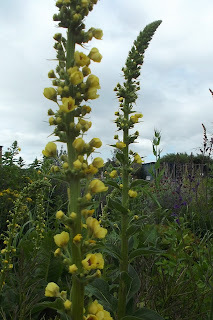 And finally a few flower pics. They're looking great all over the site at the moment. 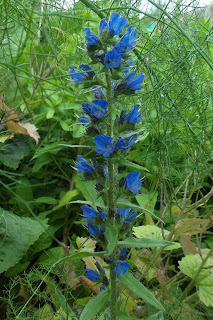 Not definite what the blue spikey flower is (bugloss?) but its stunning. Three vols got stuck in this Sunday afternoon to tackle the pond area and boy, did it need it! The recent rain & warm weather has been ideal growing conditions for the grass around the pond and for the aquatic plants (well, the rain hasn't affected them that much as they're already in water...). We've been so busy preparing for Hemlock Happening and our own Fruity Saturday events and workshops that we've not had time to tackle all of the jobs on our ever increasing, long list. If anyone fancies coming down to the allotment to give us a hand, we'll be pleased to see you! 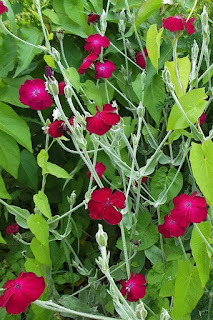 You don't have to know about gardening, just be able to pull up weeds at the moment!